A larger than usual crowd saw Linlithgow enjoy a 12-7 win over Forrester under the Mains Park floodlights on Friday night. 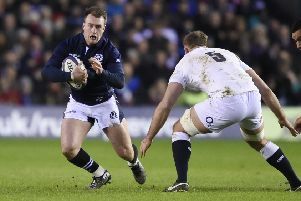 The match against the side immediately above Linlithgow in the East Division 1 table was rearranged to allow everyone to watch the Six Nations on Saturday. As it turned out, the weather deteriorated overnight and this was the only league match played over the weekend. Linlithgow’s performances have improved lately and they were looking for their fourth consecutive league victory. But Forrester were the first to press and for the first 10 minutes Linlithgow were unable to clear their lines. It wasn’t a surprise when the visitors opened the scoring with a try under the posts, but there were a couple of missed tackles in the process. Linlithgow came back and probably should have scored when Cammy Walker made a great run down the right and tried to unload in the tackle to Mark Green, but it was knocked on. Linlithgow also received an early blow as Green had to go off with a hamstring injury, replaced by Ronalson. As the half progressed, the game became quite physical as neither team could gain any advantage. There were a couple of tasty challenges and perhaps the referee could have flashed a yellow card, but he didn’t. Jack Frame brought Linlithgow back into the game with a penalty, and missed another just after. Then Frame made a lung bursting run into the visitors 22, which led to a penalty, successfully taken by Rab Cairns as Jack got his breath back. As half-time approached, Linlithgow were the team pressing for the score, but lacked a cutting edge. Rab Cairns missed a penalty just before the end of the half and Linlithgow went in trailing 7-6. The second half was mostly a midfield battle, with Linlithgow looking the more likely to score. As the game ebbed and flowed, man of the match Frame scored two more penalties to take the Linlithgow lead to 12-7. Linlithgow were always the more likely to score, but they squandered at least three try scoring opportunities, by either knocking on or waiting too long to make the pass. However the Reds defence was tight and didn’t allow Forrester any clear chances. As the half progressed Linlithgow were able to introduce quite a lot of energy into the forwards from the bench through Archer, Grant and McKillion. Although the scoreline was close and Linlithgow didn’t score a try, they always looked the likely winners, but at least they kept the crowd guessing right to the end! Linlithgow are now relatively safe, bar any SRU changes to the number of teams relegated during the season. This Saturday they are at home to second placed Royal High, kick-off 3pm, while the 2nd XV host Bannockburn at the same time.